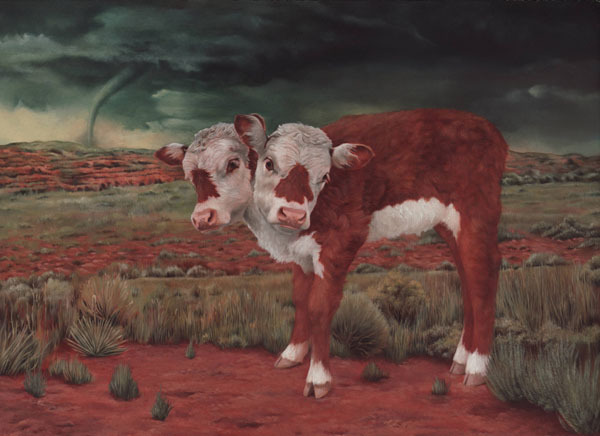 "Two-Headed Hereford, Alva, Oklahoma," oil on panel, 12" x 9"
I make pictures because I like to tell stories. I particularly enjoy telling highly descriptive and sometimes darkly humorous stories about natural wonders and weirdness. I have a profound attraction to old objects, old pictures, and old stories; the narrative of my childhood included. It is often a longing for things I have never experienced, having made contact with them only through small-scale printed images in books. As a child I spent many hours with books, putting my face close to the page so that I could breathe in the nutty warmth of the paper and study the miniature pictures. In my innocence I believed that the illustrations were drawn and painted at size. My attraction to old things and the intimacy of miniature scale are married for this reason. The stories I wish to create are sometimes best told using language borrowed from the art and particularly the painting of the 17th century. One of the defining features of northern European painting in this period is its specificity in description; its reverence in observing and recording the seen world. I like to think that this careful description, which invites close looking, allows the viewer to engage more intimately with the story I am trying to tell. Oddities, disease, and death have long fascinated artists. My attraction to morbid imagery is the product of a profound love of nature coupled with a fear and subsequent fascination with disease. My attraction to natural, life-sustaining, beautiful things is at uncomfortable odds with my attraction to natural things that can also cause suffering and death. It is borne of an overarching interest in subjects that exist in between or just outside of established categories. My paintings of these images are records of my attempt to try to understand and classify things for which there might not be a tidy classification. My work often contains images of animals. I am interested in historical interactions between science and art and the use of animals as symbols in art and visual culture. Studying animal symbolism can allow us to better understand our own nature and the nature of our relationship with the creatures with which we share our world. Drawing and painting and the study of natural history have been married since before the Enlightenment. Illustrations of animals provided access to knowledge and wonder that could best be communicated visually. Wonderment is a kind of intellectual passion. I think it can lead to better appreciation and stewardship of animals and by extension the entire natural world. 2015 Monumental Ideas/ Intimate Scale Honorable Mention for "This Too Shall Pass, 2014"
Concept art, animation assets, and illustration for Frivolous Twist's "Lexicon Larry's West Word" app. for iOS.